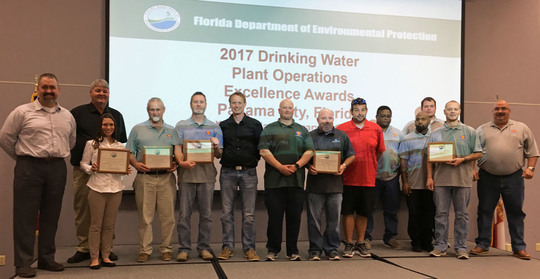 Panama City, Fla. – The Florida Department of Environmental Protection recognized five Northwest Florida utilities for their commitment to operational excellence. The 2017 Plant Operations Excellence Awards were presented to three drinking water and two domestic wastewater facilities at the annual Focus on Change Seminar. The drinking water facility award recipients were Naval Air Station Whiting Field, Destin Water Users Inc. and Bay County Water Treatment Plant. The wastewater facility recipients were the Military Point Regional Advanced Wastewater Treatment Facility and the Rivercamps on Crooked Creek Wastewater Treatment Plant. The department is awarding a total of 14 facilities, including six domestic wastewater facilities and eight drinking water facilities statewide. The other awards will be presented at district ceremonies during the Focus on Change Seminars in Punta Gorda, Ocala, Pompano Beach, Lake City and Haines City.